There were however some fantastic groups I joined last year and the Expat Coach Association was one of them. Working from home can be downright lonely. Working as an expat in a foreign country as an expat coach where you never even see your clients let alone other human beings is tantamount to self-imposed hermitage. Not only have I (virtually) met some passionate and inspiring coaches through the ECA, I have also made some great friends and learnt a lot. One of my more significant cyber member hook-ups was with Renee Lederman, an expat coach and relationship counselor who also works here in Houston. Since meeting we have had a million ideas and coffees and discussions. 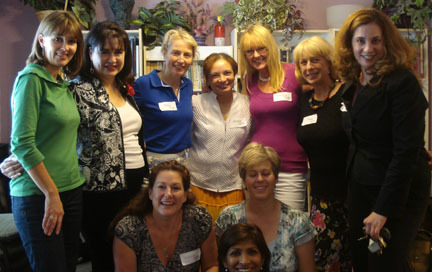 These have led to the development of Empowering Expat Women workshops (see some of our first group in photo) and guest ‘starring’ on community radio together. We have even bigger plans for this year and you will have to wait for the almighty launching of that project in February to find out about that one. Watch this space…. All of these things I would not have started on my own – thought about, yes, started, no. There is nothing like the potential synergy that awaits us – in the New Year, in that new organization we are thinking about joining – even in that coffee we have been meaning to have with that possible friend. Sometimes, just like we advise our clients, we have to make the first move and take that first baby step. What is yours for this year? One day I hope to emerge from my cave, shave off my beard, dump my hermit’s loincloth and meet all these fabulous people at the ECA. But for now, I am just really happy to be part of a group who understands and contributes to my growth and development and knows what it means to be part of the bigger picture. This entry was posted in Networking and tagged Expat Coaching, meeting people, networking, The Expat Coach Association. Bookmark the permalink. Post a comment or leave a trackback: Trackback URL.